Brian's Story: I found your Mother's Day card. Thank you, son, for this gift. How beautiful Rosaria...how special and nice to have these wonderful sweet memories of your son. 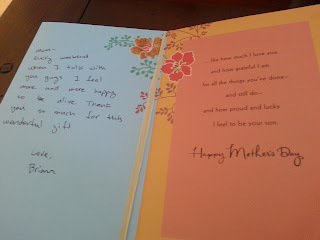 As a mother I have saved all of these precious cards over the years and when I'm missing my kids I have them saved in a special album...I always feel comforted just by reading them again and to see the words written that were and still are so really, really, special. So when we can't be with our children either through tragic loss or so many miles apart...these things can still lift up our hearts...and still make us shed a tear or two. Our children are truly a gift for as little or as long as we have them. That's priceless. What a beautiful memento. Many thanks.